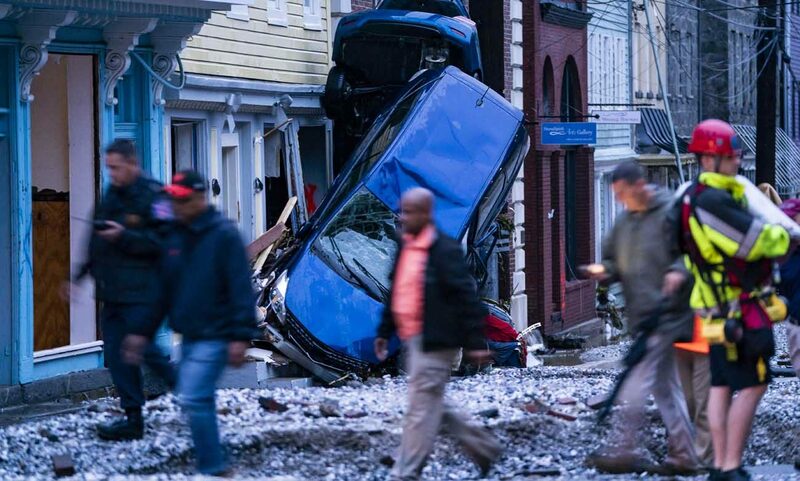 BALTIMORE (CNS) — For the second time in three years, Archbishop William E. Lori of Baltimore will celebrate a Mass at St. Paul Church in the historic town of Ellicott City, where residents are again taking stock after another devastating flash flood. Weekend worship for the feast of the Most Holy Trinity had concluded by the afternoon of May 27, when sustained, torrential rains turned Main Street below the church into a raging river that washed away automobiles, buildings and human life — just as it had July 31, 2016. Archbishop Lori will celebrate Mass June 2 at St. Paul, which was established in 1838, 66 years after the mill and railroad town was founded at was then a strategic location along the Patapsco River. St. Paul is situated relatively safely above the Main Street thoroughfare, which once again produced reminders of the destructive power of nature, documented on social media as many prepared to observe Memorial Day. A courthouse that dated to 1840 was among the structures destroyed in the historic town, which is part of the Baltimore metropolitan area and the county seat of Howard County. Eddison Hermond, a National Guardsman from Severn, was enjoying lunch with friends when he went to the aid of a woman and was washed away, toward the Patapsco. Two days later, search and rescue teams located his body on the Baltimore County side of the river. After the flash flood of 2016, St. Paul served as an emergency shelter. According to Father Warren Tanghe, pastor, the loss of water to all of its buildings and power in some of them precluded it from serving that function this time. “Our facilities are not suitable for community service,” Father Tanghe said May 28 in an interview with the Catholic Review, Baltimore’s archdiocesan news outlet. St. Paul is being used as a staging area for Baltimore Gas and Electric Co. crews that are restoring utilities. The flood was felt at Resurrection-St. Paul School, north of old Ellicott City. According to Karen Murphy, principal, one of her teachers “lost” his residence on Main Street. To the north of downtown Ellicott City, the Our Lady’s Center Marian Shrine was closed Memorial Day for what a message on its website described as “some cleaning of debris,” but noted that it “escaped damage” thanks to improvements made to its grounds after the 2016 flood.